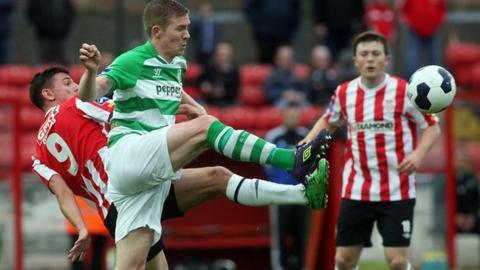 Derry City suffered another Premier Division setback as Gary McCabe's long-range strike gave Shamrock Rovers victory at the Brandywell. Midfielder McCabe picked the ball up when Derry lost possession and his effort from distance beat home keeper Gerard Doherty in the 34th minute. Rovers were denied twice as Barry Molloy made two goal-line clearances in quick succession. The Dubliners had further chances after the break but McCabe's goal was enough. Derry rarely looked like salvaging anything in the second half while Rovers felt they had a couple of good penalty appeals. The Candystripes, who had drawn their last four league fixtures, have won just two out of 12 in the league this season.